(Nanowerk Spotlight) Metal–organic frameworks (MOFs) are regarded as a new class of porous materials with significant prospects for addressing current challenges pertinent to energy and environmental sustainability. MOFs unique structure design and tunability – crystalline porous materials that are composed of both organic and inorganic components in a rigid periodic networked structure – is not readily accessible in conventional porous materials, e.g., purely inorganic zeolites. MOFs therefore offer great potential for their effective integration and exploration in various sensing applications. 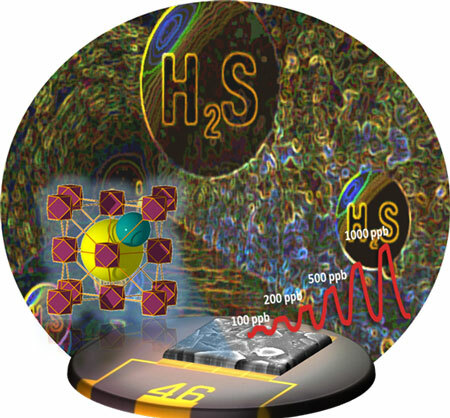 Demonstrating this, researchers have developed an advanced sensor for the detection of hydrogen sulfide (H2S) at room temperature, using thin films of rare-earth metal based MOF with underlying fcu topology (RE-fcu-MOF). "Our sensor showed a remarkable detection sensitivity for H2S at concentrations down to 100 ppb, with the lower detection limit around 5 ppb," Dr. Mohamed Eddaoudi tells Nanowerk. "The exceptional thermal and chemical stability of RE-fcu-MOFs and their high adsorption selectivity towards H2S, encouraged us explore the fcu-MOF platform for a new field of application, which is the sensing of toxic gases such as H2S." The team has published their findings in Angewandte Chemie ("H2S Sensors: Fumarate-Based fcu-MOF Thin Film Grown on a Capacitive Interdigitated Electrode"). They are confident that these findings will pave the way for the deployment of MOFs as practical sensors for various detection applications in oil industry, environmental and medical applications. According to the team, their most important result was that, surprisingly, the fum-fcu-MOF-coated sensor was able to perform well in the detection of H2S gas in the ppm range from 1 to 100 ppm with a linear response and also at a ppb level down to 100 ppb, with a linear response and a detection limit of about 5.4 ppb. Most H2S gas sensors today are developed based on principles of colorimetry and spectroscopy (i.e. absorption and fluorescence), which makes it difficult to integrate them into miniaturized electronic systems. In contrast, the KAUST team fabricated the fum-fcu-MOF as a sensing layer, a thin film on a capacitive interdigitated electrode (IDE) sensor. Salama explains that they selected capacitive sensors because of their simple structure, compatibility with standard CMOS technology, the possibility of reliable and inexpensive miniaturization, and ability to readily operate at room temperature – a feature highly beneficial for reducing both power and costs. "The sensational and excellent sensing performance of the fum-fcu-MOF paves the way for the deployment of MOFs as practical sensors for various detection applications of other types of toxic gases and vapors," Dr. Khaled N. Salama, an Associate Professor of Electrical Engineering at KAUST, points out. The team is now exploring different kinds of MOF candidates for the sensing of other important toxic gases like NH3 and SO3. In addition to that, they are working developing other types of sensors using MOFs as the sensing layer. "Our future research direction will be focused on finding the right MOF candidates, with an outstanding performance in terms of stability, selectivity sensitivity, and good adhesion properties that will be suitable to address the different types of gases or vapors," concludes Salama.